BTW ~ Why is Trig Palin not wearing a jacket, socks, shoes or even a blanket on a cold winter day in North Carolina when everyone else is bundled up? 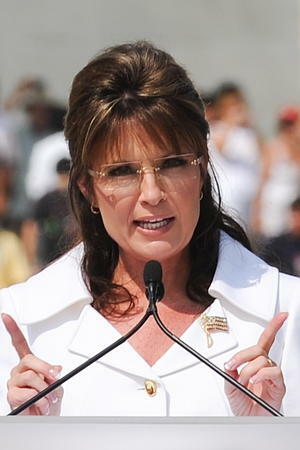 The Daily Beast has obtained the speeches Sarah Palin planned to deliver on Election Night 2008—win or lose. Read the words the McCain camp didn’t want her to say. "Sarah from Alaska: The Sudden Rise and Brutal Education of a New Conservative Superstar." One year ago Wednesday, the McCain/Palin ticket suffered a resounding electoral defeat. But for Sarah Palin, it was still only the beginning of her reign as the most talked about Republican in America—a title she can rightfully claim to this day, as her very name continues to elicit emotions ranging from abhorrence to adoration. In Sarah from Alaska we uncover new stories and insights into Palin’s ascent from Wasilla to the governor’s mansion and bring to light how her unhappy return to Alaska led to her abrupt resignation in July. In addition, we go behind the scenes of Palin’s 2008 vice presidential run, where we illustrate how internal tensions led to an all-out civil war on election night in Phoenix. We reveal the minute by minute details of how Palin turned her back on top campaign staffers and fought behind the scenes to deliver a concession speech that had been written for her in advance. John McCain and his senior aides blocked her from doing so, leading to a dramatic showdown between the candidates and their staffs that has remained untold until now.